Even if you did not know what flannel is, you have probably deduced it is a sort of fabric by now. Right you are! It is, indeed a fabric. The question is, what kind of fabric is it? It’s not quite as simple as you might’ve guessed. For starters, flannel can be made from anything. Wool, cotton, synthetics, all of that can be a source material for flannel. Of course, flannel is mostly made from organic fibers, while synthetics is usually included as a supplement. Manufacturers claim that it does not affect how a sheet would feel to the touch. That might be so but only as long as you’re not particularly sensitive. Even if you aren’t, you could still be avoiding synthetic fibers because of choice. So it might indeed be important to know if a sheet contains synthetic or not. That said, even the best-rated flannel sheets might include synthetics. All flannel sheets share some advantages, though not peculiar to them. They are rather warm. The same can be said about many sheets and blankets, but the key point is that flannel sheets help to get warm faster, thanks to their structure. The same structure also makes them soft and very comfortable. It not that critical for sheets but can be crucial for clothes. They are also durable. And that is something important and relevant for sheets. I used to have cotton sheets that would literally tear if I pulled them from under a pile of blankets. Yes, they were that fragile. Come to think of it, they were also rather cheap… but that is beside the point. Something like that would never happen to a flannel sheet. They are also very easy to wash. It hardly ever a complicated task, but sheets of some types require a very careful approach. Thankfully, it is not so for flannel. And they do not fade quickly. So, as you can see, there’s a lot of reasons to get a set of flannel sheets. If anything, they make the best cotton sheets. Though flannel sheets have numerous advantages, they are not entirely free from drawbacks either. The most common one is lint. That’s right, flannel is extremely prone to pilling, more so than plain cotton or wool fabrics. It mostly because of how fluffy it is. That is not something easy to fix. Most natural fabrics accumulate lint, but flannel does it at accelerated rates. 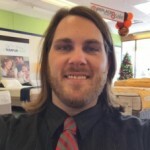 The only thing you can do is to choose sheets made with synthetic fibers, and that would be a temporary solution unless the flannel is 100% synthetic. Another disadvantage is that flannel takes a long time to dry. I don’t just mean after washing. Even if your sheets got a bit damp, it’d take them hours to dry. It’s hard to help it either. Again, the fluffiness of flannel has an inherent drawback. Additionally, some of the types of flannel wrinkle all too easily. They are also easy to smooth out, so there’s that. As you can see, most of the drawbacks are simply inconveniences. You can just disregard them when buying a set of flannel sheets. Just make sure you’re buying high quality sheets. This set of sheets only comes in four sizes and a single type of print. While that may not seem like a lot, it does include the most popular sizes. As for the print, it is floral themed unlike many other flannel sheets, which look like they are only suitable for children. Unfortunately, too many manufacturers seem to associate flannel sheets with childishness these days. Which, I believe, is not the right approach. But be it as it may, this particular set of sheets has a rather ascetic print. That’s rather encouraging. Does it have any disadvantages? Well, that depends. It is imported, so there is that. If you avoid products made outside the U.S. perhaps, you should probably buy another set. But, really, that’s not a good reason to not buy it. After all, they are made from 100% natural brushed cotton. The problem is, they pill way too quickly. The manufacturer supplies the sheets pre-shrunk. Shrinkage can be a real problem with some types of sheets, but not with these. The entire set is rather standard. 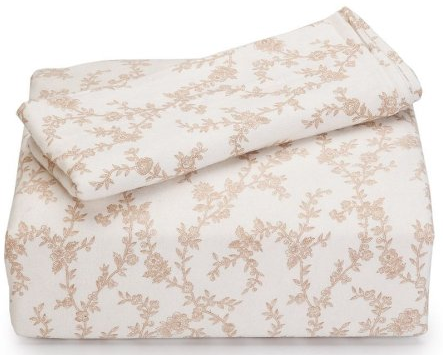 It includes a flat sheet, a fitted sheet, and a couple of pillowcases (unless you’re purchasing the Twin Size, in that case, the set only comes with one pillowcase). The fitted sheet is suitable for mattresses up to 15 inches in height. 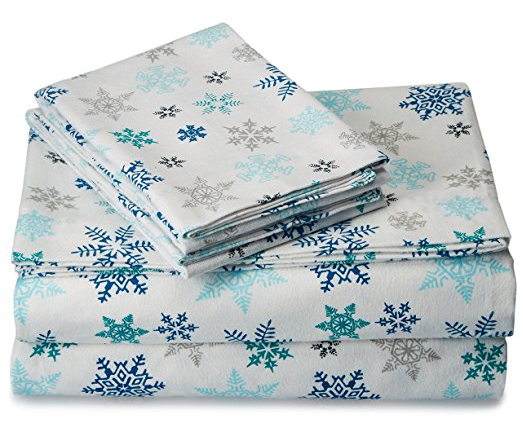 It’s winter as I’m writing this, so it makes perfect sense to have a set of snowflake printed flannel sheets. Right? Right? Meh, I wouldn’t say so. Sure, some people will definitely love this set. But some others will find it too childish. And out of place, depending on when exactly they buy it. You have to agree, a set of sheets with snowflakes would look very strange in the middle of June. Cute, but strange. Not everyone’s ready for that. Of course, if you have children, this could be a good gift for them. Just don’t buy it as a Christmas present, I know my kids would appreciate such a gesture. The set includes a flat sheet, a fitted sheet with elastic on sides, suitable for mattresses up to 18”, and a couple of pillowcases. 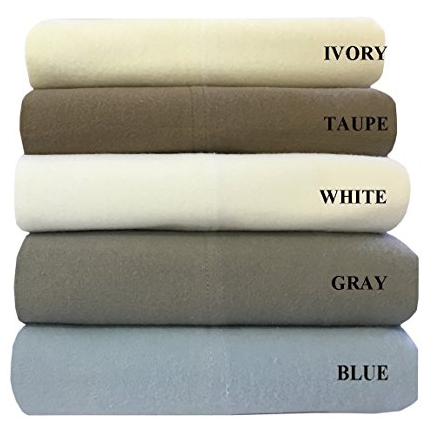 Sewn from natural brushed cotton flannel, it is also preshrunk, and the fitted sheet doesn’t slip. This Eddie Bauer set is imported, so if you prefer American products, you might not like these sheets. The set also has one other drawback, the fitted sheet’s elastic stretches after some time. If you think that a floral print is ascetic, and you like that, reflect on this set. It does not have any print at all. And that’s the point. 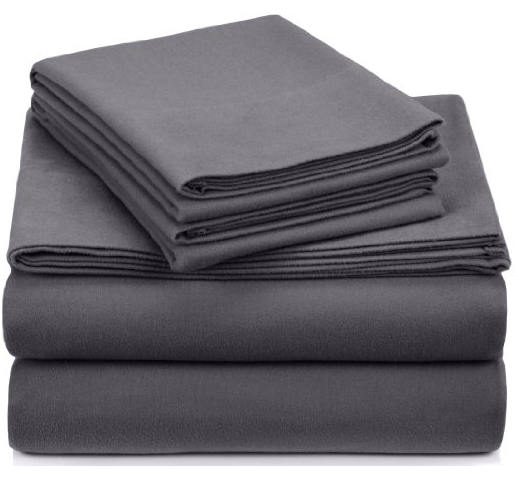 If you prefer a one-color solution, the Pinzon Heavyweight Flannel Sheet Set is exactly what you need. It may only come in three sizes, but it does have eight color varieties to compensate. The Pinzon Heavyweight set is rather standard. A flat sheet, two pillowcases, and a fitted sheet. Nothing unusual there. What it unusual is everything else. First of all, the flat sheet and the pillowcases come with a 4-inch hem. That’s more than enough in my opinion. At least, I can’t think of a reason to choose sheets with wider hems. Maybe, some people do have a need for wider hems. As the name implies, this is a set of heavyweight sheets. They are very dense and don’t pill easily. That said, it doesn’t mean they won’t pill at all since flannel always pills. The set is, however, imported from Portugal. Also, sometimes the sheets do pill rather excessively, more than average. It’s easy to avoid if you follow the instructions when washing them. Though the name of the product has the word “heavyweight” in it, it is not the most heavyweight flannel sheet I can think of. There are heavier ones, though not by much. What makes it better, then? Well, the fitted sheet does have high-quality elastic on all sides to ensure a better grip. And it’s good for mattresses up to 16 inches. As you have no doubt understood, the set is rather standard. A flat sheet, a couple of pillowcases and a fitted sheet. The usual. But a perfect match for most beds. The label says it’s made from 100% natural cotton. Well… there is cotton indeed. But I wouldn’t say it’s one hundred percent. It looks like this particular blend has some polyester. This is a single color set of sheets. No prints, either childish or not. Although the color scheme makes them suitable for all seasons, I would recommend using them mostly for winter, if only because of how warm they are. That said, they are not entirely unsuitable for summer. Even though something less fluffy would fit better. This is not a choice for everyone. This set of sheets is far from the cheapest you could find on Amazon or, indeed, anywhere. That said, it is not the most expensive either. Believe me, if my goal were to recommend the most luxurious bed sheets, I would have found really expensive sets. But, even though these are not high-end sheets, the are still luxurious. And their price, while high, is not high for luxury sheets at all. How come? Well, these sheets are not made from 100% natural cotton. 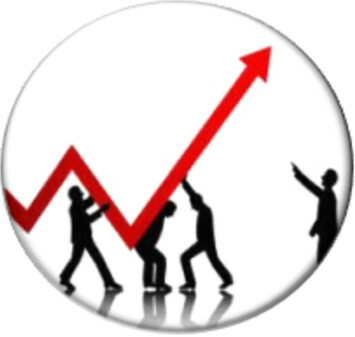 You will find that polyester is one of the most used materials when it comes to sheets, and this is one such instance. Of course, if you want organic, this set is not for you. It just isn’t. On the upside, it doesn’t pill at all. Zero lint. And, let me tell you, this is not something you will see often. That’s what micro flannel is all about. And, thanks to the fact there’s so little cotton there, this fabric does not wrinkle or shrink either. 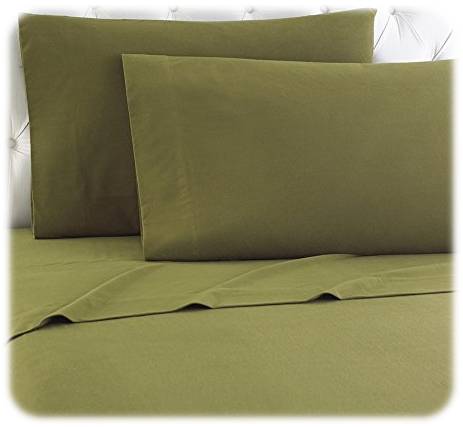 Although not quite as natural as some other sheets, this set is relatively low-maintenance. The best time to buy flannel sheets is winter. After all, they are the best choice for winter. Warm, comfortable, fluffy. Unless you have your own preferences, this is what you probably should get. And then there’s the fact they are perfect for children. No matter the season, flannel sheets are a good way to solve so many problems.